This year's Project is a little more grounded in reality. It's CES, and that means Razer is in Las Vegas with another one of its concepts. As the company recently released its first smartphone, it's not too surprising that the Project Linda hardware ties into that: It's a laptop dock for the Razer Phone. Razer's take on the laptop dock is a little different. The phone slides into a cavity where you'd typically find a trackpad, replacing the need for one entirely. Push a button on the keyboard's corner and a connector smoothly slides out of the cavity, making a satisfying whirring noise as it connects firmly to the phone's USB-C port. A notch in the tray gives access to the handset's side-mounted fingerprint reader, and also doubles as an easy way to lift the phone out of the tray once it's disconnected from USB. Marketing manager Kevin Sather said the two devices weren't "fully" designed in parallel, but the fit and finish is seamless. There's nary a gap between the devices, and when the phone is sitting in its tray, it looks like a typical trackpad versus a snap-on accessory. You might even mistake the whole setup for a smaller version of the company's Blade laptops given the CNC-machined aluminum unibody design. It's a bit thicker than those (by .05 inches) to accommodate the phone and ensure a flush surface between the handset screen and dock body, though. It's hard to ignore that phone's glossy screen when docked for a few reasons, superficial and otherwise. Using the phone as a trackpad was a little awkward because, unlike the trackpads we're so used to on traditional laptops, the glossy screen kept "grabbing" my fingers and thumbs as I dragged them around to navigate Project Linda's vibrant 13.3-inch Quad HD display. While docked, you can mirror the phone to Project Linda's monitor, or use it as a second screen for certain games and apps. The device has a pair of USB ports -- one full-size and one USB-C -- for any accessories you'd want to connect (like a mouse). Using a mouse feels natural enough, and navigating everything should feel comfortable for Windows users. There's a faux Start menu in the lower left corner of the display, and a taskbar for open apps. Rounding out the other features are a 720p webcam, a dual-array mic and a 3.5mm audio jack -- something the phone itself lacks. Typing out a quick email in Gmail on Project Linda's full-size, backlit Chroma keyboard was a comfortable experience, too, and for a second I forgot that I wasn't using a real laptop. When I instinctively used the keyboard to copy text, everything reacted the way it should. Keeping the delete key pressed to eliminate the text was a bit stuttery, however, and there was a brief moment between deleting each successive word in a sentence. The dock's body is empty, save for 200GB of storage and a 53.6Wh battery, which can fully recharge the Phone three times. Sound comes from the Razer Phone's speakers. That makes Project Linda hardware much lighter than it looks, too. At just over 2.75 pounds (1.25 kilograms) with the phone docked, the device definitely feels like something I could toss into my messenger bag and not even notice being there. 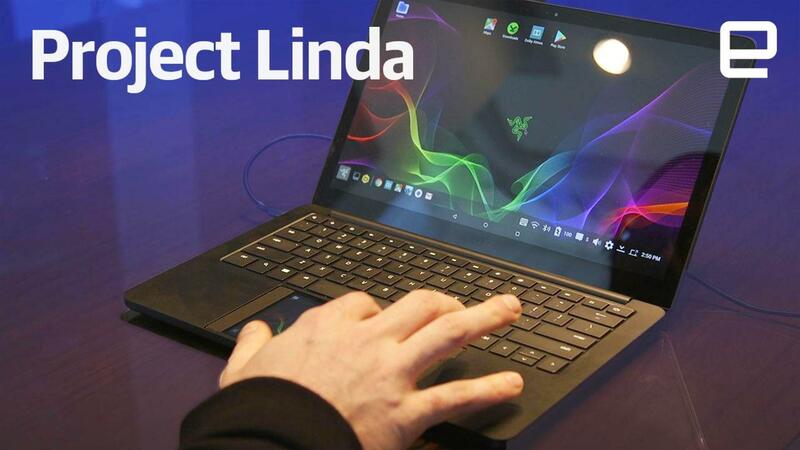 While Project Linda definitely feels like near-final hardware, Razer stressed that it's still a concept. There are some bugs to work out with the way Android treats a second screen, for instance, and Razer says that the palm-rejection tech still needs some improvement as well. Ultimately, the company hopes that Project Linda's screen will be a larger replica of its phone's screen. Meaning that final hardware would feature a 120Hz Quad HD touchscreen that's HDR capable -- specs that don't exist at 13.3 inches yet. For now, Razer is happy to gather feedback from its fans and the press, and use it to inform the final product's design, if and when it ever comes to market.